Anholt Offshore Wind Farm is a Danish offshore wind power wind farm in the Kattegat, between Djursland and Anholt island. With a nameplate capacity of 400 megawatts (MW), it is one of the largest offshore wind farm in the world (along with BARD Offshore 1) and the largest in Denmark. 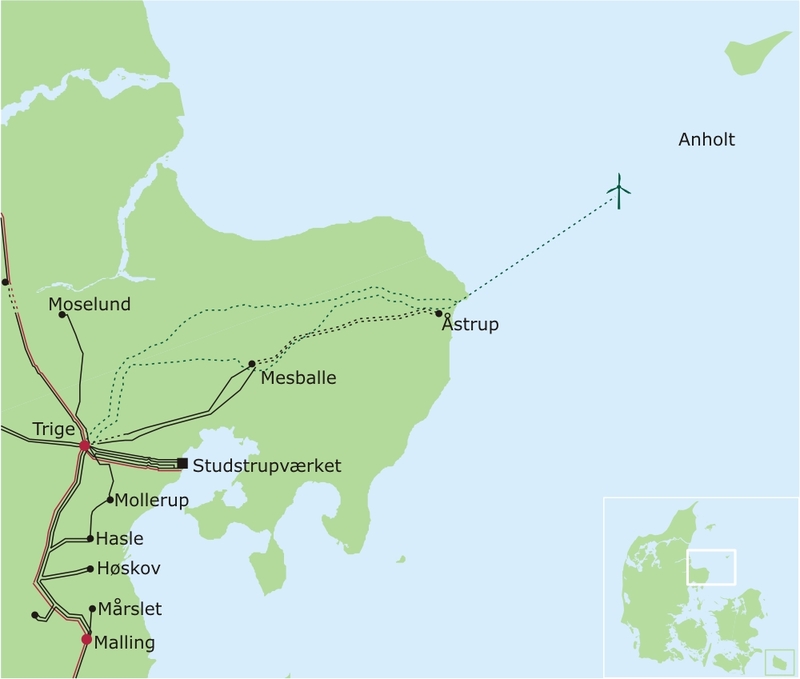 A cable from the wind farm to Anholt replaces most of the diesel-powered electricity on the island. The project was conceived in February 2008, as part of the Danish government's Energy Policy Agreement. The wind farm costs an estimated 10 billion Danish kroner (€1.35 bn, US$1.65 bn). During operation, DONG receives a feed-in tariff of 1.051 DKK/kW·h (17 US¢/kW·h) for the first 20 TW·h (about 12–13 years of production), whereas the 207 MW Rødsand 2 receives 0.629 DKK/kW·h for 10 TW·h. DONG Energy was the only bidder for the project, and received the license to build it in 2010. Newsmedia and politicians suggest a tight schedule with tough sanctions as reasons for the single bid and higher price, and the subsequent Horns Rev 3 offshore wind farm had 4 bidders in 2015 and costs 0.77 DKK/kW·h, well below the 105 øre at Anholt. DONG contracted Siemens Wind Power to supply 111 3.6 MW wind turbines for the project, placed in 14 metres (46 ft) water depth. A platform holds 3 transformers which increase voltage from 33 to 220 kV for transporting the alternating current power 25 kilometres (16 mi) to land through a single 3-conductor cable (diameter 26 cm or 10 in) and a further 56 km (35 mi) to Trige (near Aarhus) where a 400 kV main power hub can distribute the power. There are switchyard reactors along the cable to provide reactive power to compensate for line capacitance. The agreement required first power to be produced before the end of 2012, and be fully commissioned before the end of 2013. In March 2011, DONG Energy sold 50% of the Anholt wind farm to a consortium consisting of PensionDanmark (30%) and PKA (Pensionskassernes Administration, 20%) for DKK 6 billion (US$1.14 billion) payable in 4 rates between 2011 and 2013. Usually, turbines are placed in a grid pattern of lines and rows. But the turbines of AOWF are placed in an unusual pattern, governed by two principles: put most of them along the edges, and put most in undisturbed airflow from the main direction, which is West-southwest. This would increase production by 1.5%, a lifetime value of more than 100m DKK. On 31 December 2011, the heavy lift vessel (HLV) Svanen placed the first foundation monopile. Official construction of the wind farm started on 13 January 2012. The first turbine was installed on 3 September and connected to the Danish power grid on 21 September. In May 2013, AOWF became Denmark's largest wind farm when 59 turbines were grid connected, totalling 212MW and surpassing Horns Rev 2. The vessel Sea Installer managed to erect a complete tower (saving time), and installed a wind turbine in 7 hours. On 19 May 2013, the installation vessel Sea Power erected the last of the 111 turbines at Anholt Offshore Wind Farm. The wind farm achieved full power in June 2013, and was inaugurated and commissioned on 4 September 2013. The connection cable has been out of service two times; first the land cable failed for a week in 2014 costing Energinet.dk 9 million DKK in compensation to DONG. In February 2015 the sea cable failed, and Anholt island reverted to its diesel engines. As of 2015[update], the farm has produced 4,427 GWh. Wikimedia Commons has media related to Anholt Offshore Wind Farm. ^ a b "Capacity factors at Danish offshore wind farms". energynumbers.info/. 23 September 2014. Retrieved 9 November 2014. ^ Anholt offshore wind farm Archived 8 November 2010 at the Wayback Machine (in Danish) Danish Energy Agency. Accessed: 27 November 2010. ^ Backwell, Ben (1 May 2009). "Denmark launches Anholt offshore wind farm tender". Recharge. Retrieved 23 June 2010. ^ Hanne, Windemuller. Anholt Offshore Wind Farm will be the largest in Denmark Archived 30 September 2011 at the Wayback Machine Danish Energy Agency, 2 July 2010. Accessed: 27 November 2010. ^ Pia C. Jensen & Steen Hartvig Jacobsen. "Wind turbines in Denmark Archived 23 October 2013 at the Wayback Machine", page 26. Danish Energy Agency, November 2009. Accessed: 4 September 2013. ^ "Anholt - tender of 400MW". Danish Energy Agency. Archived from the original on 20 October 2010. Retrieved 23 June 2010. ^ Bjartnes, Anders (22 June 2010). "Dong gets green light for 400MW Anholt despite high prices". Recharge. Archived from the original on 28 June 2010. Retrieved 23 June 2010. ^ a b Jan Bjerre Lauridsen & Søren Andersen. "Queen says Good Wind to giant turbines" (in Danish) Berlingske, 4 September 2013. Accessed: 4 September 2013. ^ Erik Holm & Sanne Wittrup. "We should learn from Anholt" (in Danish) Ingeniøren, 8 April 2010. Accessed: 4 September 2013. ^ Wittrup, Sanne. "Svenske Vattenfall skal bygge Danmarks næste havmøllepark " Ingeniøren, 26 February 2015. Accessed: 26 February 2015. ^ van Loon, Jeremy (22 June 2010). "Siemens Wins 111 Offshore Wind-Turbine Order in Denmark From Dong Energy". Bloomberg L.P. Retrieved 23 June 2010. ^ a b "Djursland Anholt". 4C Offshore Limited. Retrieved 23 June 2010. ^ Kvarts, Thomas. About the seacable (in Danish) Energinet.dk. Accessed: 27 November 2010. ^ Kvarts, Thomas. About the landcable Archived 29 November 2010 at the Wayback Machine (in Danish) Energinet.dk. Accessed: 27 November 2010. ^ Damgaard, Poul. About the transformator platform Archived 29 November 2010 at the Wayback Machine (in Danish) Energinet.dk, 20 August 2010. Retrieved: 24 October 2010. ^ Gaardestrup, Rikke Bille. Connection of offshore wind farm Anholt Archived 19 July 2011 at the Wayback Machine Energinet.dk, 30 November 2009. Retrieved: 24 October 2010. ^ "Nettilslutning af havmøller ved Anholt". Energinet.dk. 26 November 2012. Retrieved 27 March 2017. ^ "PensionDanmark and PKA to become co-owners of Denmark's largest offshore wind". DONG Energy. 28 March 2011. Retrieved 30 March 2011. ^ Pedersen, Lars Dalsgård. DONG sells half of Anholt wind farm Energy Supply, 28 March 2011. Accessed: 10 December 2011. ^ Sanne Wittrup. "Bonus for new pattern of turbines" (in Danish) Ingeniøren, 2 May 2011. Accessed: 4 September 2013. ^ "Anholt Offshore Wind Farm Newsletter, January 2012". DONG Energy. January 2012. Archived from the original on 10 June 2012. Retrieved 16 January 2012. ^ "Today we start construction of Anholt Offshore Wind Farm" (Press release). DONG Energy. 13 January 2012. Archived from the original on 5 October 2013. Retrieved 16 January 2012. ^ "First power from Anholt offshore wind farm" (Press release). DONG Energy. 21 September 2012. Archived from the original on 5 October 2013. Retrieved 24 September 2012. ^ "All turbines are erected at Anholt Offshore Wind Farm" (Press release). DONG Energy. 15 May 2013. Archived from the original on 29 June 2013. Retrieved 3 June 2013. ^ Wittrup, Sanne. "Fejl på søkabel stopper Anholt Havmøllepark i tre uger " Ingeniøren, 23 February 2015. Accessed: 23 February 2015.